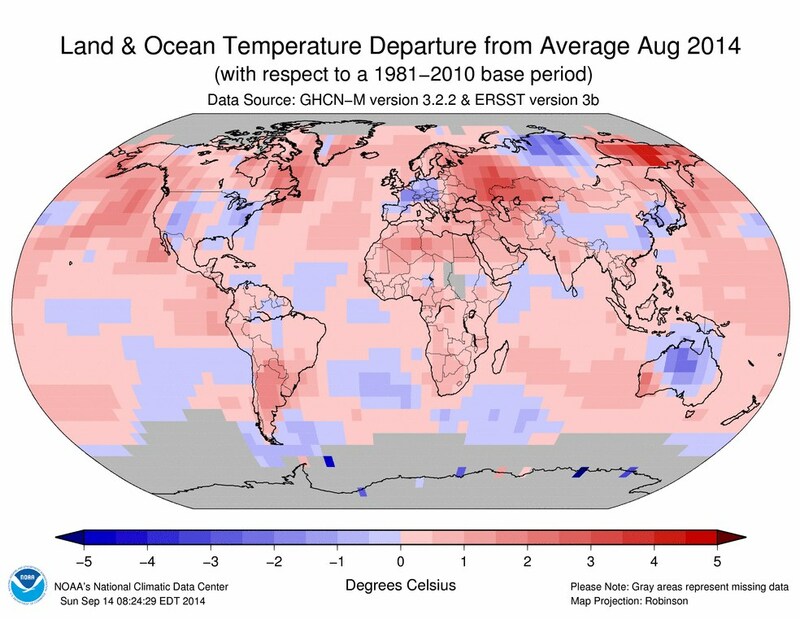 In case you didn’t see it, this August was the hottest August on Planet Earth since record-keeping started in 1880. The summer period, June-August, was also the hottest. The first map at right shows temperature anomalies for August across the world. I’m not sure why NOAA likes anomaly graphs so much, but they do. First, for each square shown on the map, they computed the average temperature in August for the last 30 years (1981-2010). Then, in each square they compared the temperature this August with the average. The result is shown on the map. Red means this August was hotter than average, and the darker the red, the hotter it was. Blue means cooler than average, and the darker the blue, the cooler it was. The map is predominantly pink and red. The hottest areas were in Russia. The coolest were in Russia, Australia, and Europe. Portions of the United States were warm, but much of the country was cooler than average. California was warmer than average. Do you think that might be contributing to the drought they are having? West Africa was warmer than average. Do you think that might be contributing to the Ebola outbreak they are having? The Middle East was warmer than average. Do you think that might be contributing to the unrest they are experiencing? And so on. By creating drought and reducing food yields, by threatening water supplies and by encouraging disease-spreading pests, by degrading air quality and increasing lung disease, global warming contributes to all sorts of problems around the globe. That is why the CNA Military Analysis Board identified climate change as the #1 security threat facing the United States. I’ll publish a post on their report in October. National Climate Data Center. 2014. Global Analysis – August 2014. http://www.ncdc.noaa.gov/sotc/global/2014/8. In the data fields, Report = “Global Analysis”; Year = “2014”; Month = “August”. By mogreenstats in Climate Change, Other Climate Change on 2014/09/19 .